One of the things that I missed in current versions of Microsoft's Chromium-based Edge browser was native translation support. Microsoft released previews of the Chromium-based browser this week; previews are limited to Windows 10 officially (even though there is an option to install the Windows 10 installer on previous versions of Windows) and the Dev and Canary channels. The upcoming web browser is still in a pre-release development phase. While it works just fine as it is, certain features are missing currently. Microsoft revealed some, e.g. Spellchecking support, when it announced the availability of the first public builds of the Chromium-based Microsoft Edge browser. It was not clear up until recently if the new Microsoft Edge would support native translations or if users would have to install the Microsoft Translator extension instead for that. Note: We file this under rumor for the time being as we cannot verify integration of Microsoft's translate feature in the browser at the time of writing. We will update the article when that happens. Reports suggest that Microsoft Edge could get native translation support after all. 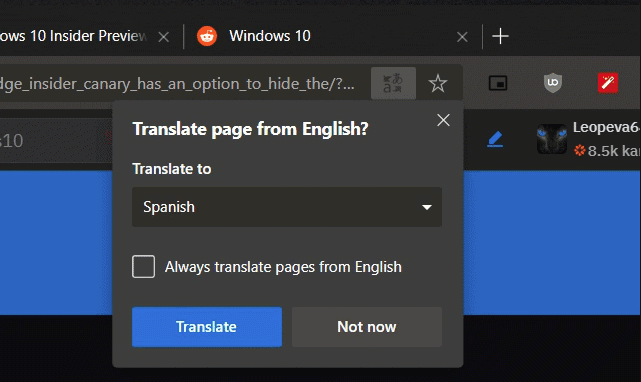 Some users report on Reddit that they get translation options in the latest Microsoft Edge Canary build; others stated that they did not have the translate option in the latest Canary build. It appears that Microsoft is running A-B tests or rolling out the feature gradually over time to the entire population. The classic Microsoft Edge browser did not support translation natively. Users had to install the Translator for Microsoft Edge extension to integrate translation functionality in the browser. Microsoft did add native translate functionality in the Android version of the Edge browser in 2018 however. Microsoft Edge Canary is the cutting edge version of the browser that gets updated daily according to Microsoft. Microsoft Edge displays a translate icon in the address bar when it detects that a web page is not in the system language (maybe also not in any other installed language on the system). A click on the icon displays options to translate the page into another language similarly to how Google Chrome handles native translations. It is possible to check the "always translate pages from" box to automate translations from that language whenever pages are loaded that are in that language. The main Edge menu lists a "Translate to" option as well, and the settings feature a new preference to enable or disable the translation feature in the Microsoft Edge browser. Microsoft needs to get the first public release version of the Chromium-based Microsoft Edge browser right, and that includes integrating popular features natively in the browser and offering features that Google Chrome does not offer. Translation is a useful feature, especially when it is integrated in the browser. While not mentioned by users who can use the feature already in Edge Canary, it is Microsoft's own translation service that Edge uses for these translations. Now You: What does the Chromium-based Edge need to become more successful than the classic Edge? to insert their own code? I wonder if they will screw with users when they see edge as the listed browser. I doubt Google cares that much. At the end of the day, Microsoft making this switch is a bit of a win for Google, because Google still has outsized influence on the Chromium base and Microsoft basically admitted defeat by dropping their own engine and going with Chromium. If Google does anything, it will probably be similar to how the Google homepage would occasionally flash “warnings” about using Edge and that they should switch to Chrome. And even that might not be an issue anymore since I have never seen those warning with any Chromium-based browser. youtube chrome blob incoming. it would be a sad for me because I use Vivaldi, but I wouldn’t blame them for going this route. Vivaldi, Opera and other Chromium based browsers have already done this long before Microsoft does. And Chromium is an opensource project, so I doubt Google would make a fuss about that. I am left wondering or you whether or not convinced that the build in M.s. translator integration does do a better job (Or better works) than for instants the Firefox add-on translator or the add-on Grammarly (or even Deepl.com), to name a few? Where in the total spectrum of translators (and maybe even the correction market) do you rank this translator? Do you give it a high score, medium score or a low score in terms of logically appropriate in the sense of structure choice and logical choice of words? The one feature that I love about old Edge is the high quality video streaming, which I feed to a 4K LG TV. Chrome is pretty bad, with grainy images. Edge 74,75 is already somewhat better than Chrome with 1080p support. But, it’s not yet as good as old Edge, with slightly less clarity. I hope that it plays great when ready for release. Fingers crossed here. It says can’t install the browser on the device because it doesn’t meet the minimum hardware requirements. What are these minimum requirements? An automatic “clear on close” of selected data and cache would sure be welcome. As with any chromium-like browser, the internals are still available with the edge://edge-urls/, so I hope they don’t start adding restrictions to those or the edge://flags/. Why do they even bother ? In a few years time they end this browser…..